Tor has been recovering the Robert Jordan's classic fantasy series The Wheel of Time in lead up to the final two books, due out at the end of this year and late 2011/early 2012, respectively. While I'm not the biggest fan of the original covers to Jordan's books, I do applaud Tor for sticking with the artist through the end. I hope that when the series is done, Tor republishes the series in physical format with these new covers, either in paperback or HC. I would have to assume this is the case because it's a shame for such great work to only see the light of day in electronic format. My kindle doesn't even support color. Michael Kormarck's reenvisioning of Knife of Dreams is no exception to the trend established by the previous artists. 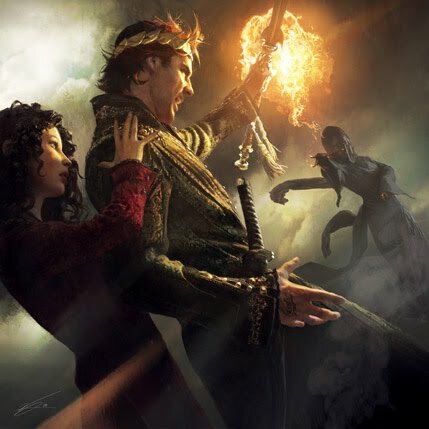 Kormarch has previously done a lot of work depicting scenes and characters from GRRM's A Song of Ice and Fire, one of the only series capable of competing with Jordan's masterwork. Irene Gallo comments on a sense of frozen motion and permanent imbalance in the work over in the blogpost and I must say I agree. And that photorealism is quite amazing.